Sometimes I feel overwhelmed. I know I am not the only one who is balancing on that fine line between “okay” and “not okay”. This week brought one kid’s winter cold, another kid’s blood drawn, six nights of bad sleep for everyone in the house, a holiday, too much fast food, a day off of school for another holiday and most likely a day off of school for freezing cold. And my crown popped off in a Valentine’s Day caramel. All of these are small things, taken individually, but they’ve pushed me into “I am going to sit and stare into space until I figure out what to do or until elves come and solve every problem for me” mode. I have to say, I am always hoping the elves show up soon, because I am not the best at prioritizing what needs to happen next when everything needs to happen at once. When overwhelmed, I tend to pick the most absurd chore I can find. I tackle it for one to two hours. I feel immensely better and more in control of my life, though in reality I’ve squandered a lot of precious time and energy. Last week I cleaned every baseboard on the first floor of our house. Some spots were immensely dusty and grimy, but not anymore! Never mind that you can’t even tell now because so much clutter is obscuring it. The week before I tackled personal grooming-I scrubbed and buffed and shaved and moisturized. I used every beauty product in my arsenal. The next night I forgot to take off my makeup so I had raccoon eyes and the clogged pore beginnings of pimples by morning. This week I had been reading a book on decluttering which, among other things, suggested that socks have a very hard life, living as they do between foot and shoe all day. My socks need to rest, and should not be balled up so uncomfortably. 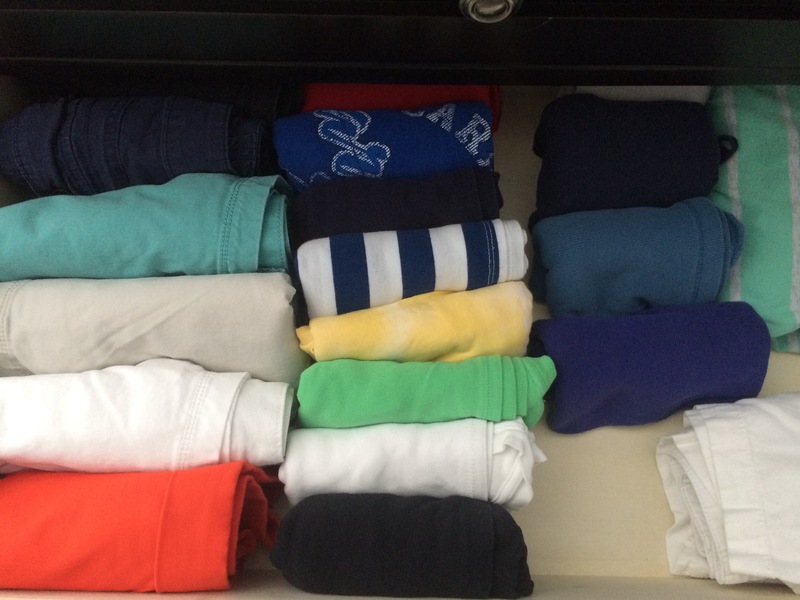 Also, my t-shirts would be so much happier folded in a kind of a roll, not piled up on each other. So this week, I tried to make my clothes more comfortable. The winner, though, in the “This is the most unnecessary task I can think of at this point in time, and I will do it thoroughly and with gusto” award goes to…sorting through every single one of the eighty-two episodes of Wild Kratts that live in our DVR. About two weeks before Christmas, with almost every hour planned out to make sure we didn’t miss a present, an event, or a holiday memory, I started going through them. It had irritated me that some episodes were mislabeled, some were repeated, and it took extra time to find the one we wanted. 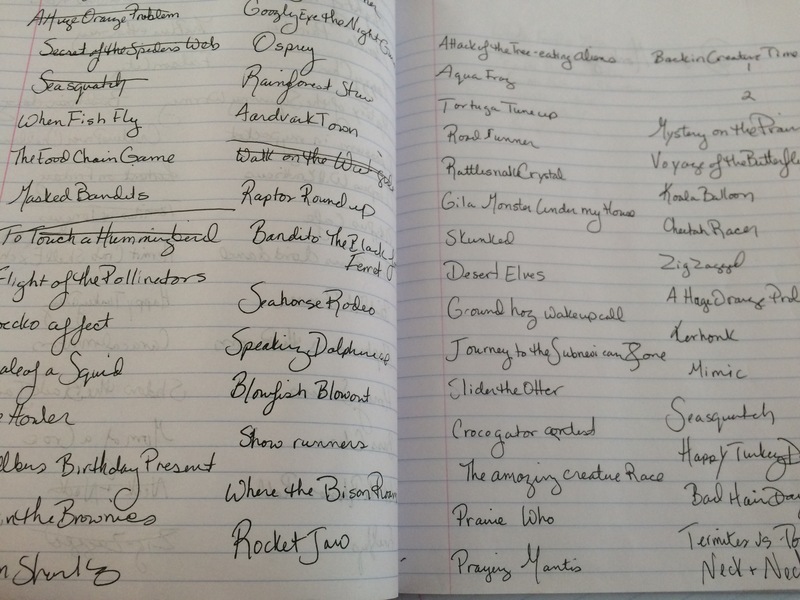 So, I wrote down the name of every episode, I fast-forwarded to see if the title was correct, I deleted duplicates. I don’t want to tell you how long I spent doing this. It was longer than any other random project I’ve decided to tackle on a weekday while feeling overwhelmed. It feels silly to admit, but it felt good that something was in order. Next week, I’m hoping things go a lot more smoothly. If not, I am wondering if I’ll feel like the most important thing in the world is to sort through my eight-year-old teaching materials, or research 101 dairy-free crockpot recipes, or maybe comb the DVR for errant Peg + Cat episodes. At least we only have 30 of those. Next > What Are You Afraid Of?